An error was notated on 5/10/13. It has been corrected. This pattern is written so you may use any needle and any yarn and make any size sweater….yes…really! Three borders of three different difficulty levels are provided. 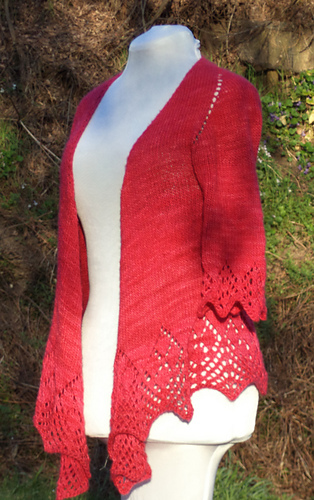 You may also insert any border from any triangular shaped shawl border you want. I wanted to give you a “canvas” to create your perfect sweater. So many of us love shawls but just have no where to wear them, or just don’t know how. 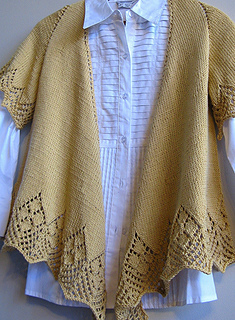 Here is your chance to take that beautiful shawl and make a cardigan. If you are an experienced knitter this pattern will be a breeze. If you aren’t as experienced the knitting itself will be easy, but you may need some assistance on the fit. I suggest a visit to your local yarn shop (where you bought your yarn), or your knitting mentor if you need help. Give your local shop a call to find out how they operate help time. Choose a yarn that will block well and has some give. For less experienced knitters I suggest animal fibers that are more forgiving. Because this pattern is adaptable for any size using any yarn, the exact yardage cannot be given. You should have an idea how much yarn you might normally use for a sweater for your intended wearer, you will use about the same amount. You should always buy enough yarn to complete your project, I suggest over estimating to make sure you don’t run out. Choose needles that give you a wide open stitch. You will need circular needles at least 32 inches long and needles of the same size to work your preferred method of working in the round for the sleeve. Exact stitch counts for each size are not provided, you need to know if you are knitting a standard size or a plus size before you begin. 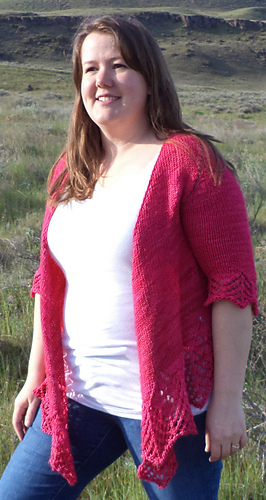 You will then knit the pattern as you would a standard raglan sweater until it “fits” the intended wearer.